Female potato farmers in Bihar, India, join forces to negotiate fair prices and claim a bigger share of the revenue from their harvest. 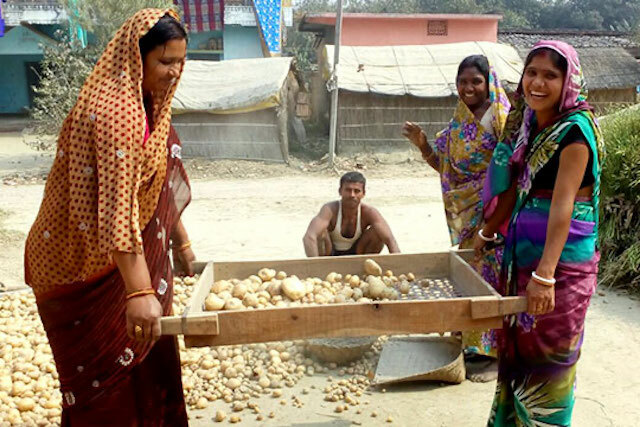 Women in Bihar are earning a higher price for their potatoes by selling through producer groups established through TechnoServe's WARDA program. First introduced to India by the Dutch and the Portuguese during the 17th century, and later promoted by the British in the 18th century, the humble potato has long shed its colonial roots and is now a staple in the Indian diet. Even as certain tubers are avoided by some communities because of religious observances, the batata or aloo – as the potato is known in western and eastern India respectively – is central to the diet of Indians, both rich and poor. It holds special significance in Bihar, a poor agrarian state where 60 percent of the population is dependent on agriculture. As the fourth major crop in the state – after rice, wheat, and maize – the potato is cultivated predominantly by smallholder farmers and and is widely consumed in rural households. With nearly 90 percent of production available as marketable surplus, the tuber is also an important cash crop. Yet until recently, smallholder potato farmers were at the mercy of market inefficiencies that stemmed largely from intermediary buyers. In the journey from farm to plate, the potato passes from smallholders to local village-level traders, to wholesale mandi brokers, and finally to large buyers and retailers before reaching the end consumer. At each stage, commission is added to the crop’s value, while the farmer’s share remains fixed at the low price received at the farm gate. 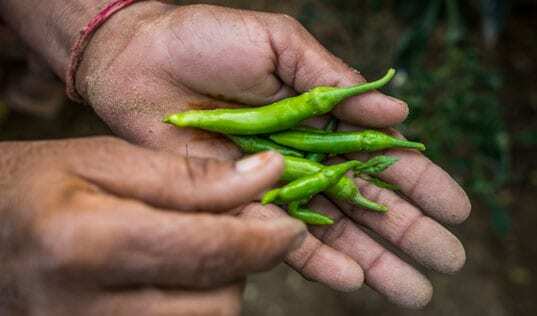 Moreover, local traders often engage in faulty weighing practices, and payment for the crop can be severely delayed or lost entirely, placing farmers’ livelihoods at risk. Renu Devi farms a small half-acre plot of land, and relies on the income from potatoes to help feed her family of five. 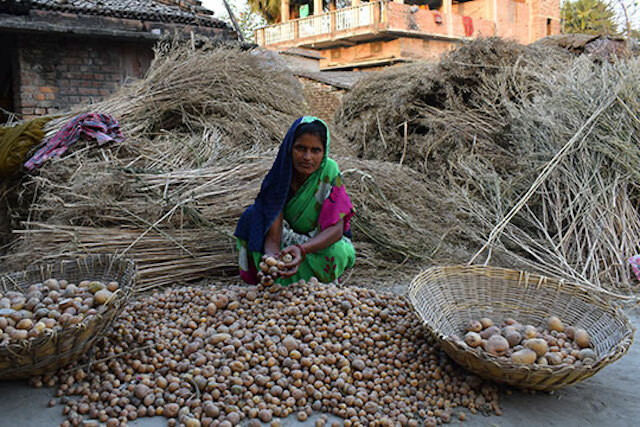 But like other farmers in her community, who have limited access to market information and no alternative way to sell their produce, Renu was forced to sell potatoes at whatever low price the local traders quoted. In addition to improving her own income, Renu Devi is mobilizing other women in her community to realize greater profits from their crops. 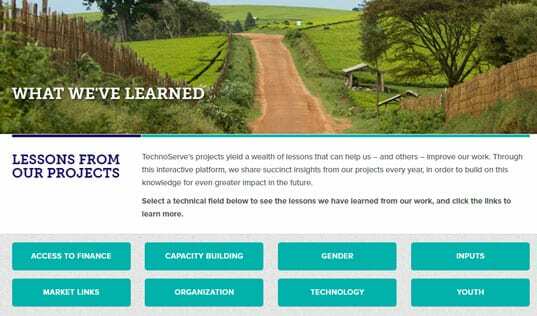 But TechnoServe is working with Renu Devi and 10,000 other farmers to ensure a fair price for their produce through the Women’s Advancement in Rural Development and Agriculture, or WARDA, program. The three-year program is building the capacity of producer organizations in Bihar in multiple value chains (including maize, vegetables, mango, and litchi) by providing technical assistance to the JEEViKA program of the Government of Bihar. WARDA launched a pilot project in 2017 that demonstrated the effectiveness of aggregating and marketing potato through a Farmer Producer Organization (FPO) – a community-owned institution allowing a group of women farmers to operate with a collective voice. In 2018, the program was extended to Vaishali district, which includes Renu Devi’s small village of Bishunpur Madhaul. The project team provided trainings to farmers on best agricultural practices as well as post-harvest management, including cold storage facilities to allow sales in the off season. Renu and her peers learned grading and sorting practices, and how to price their produce based on grade to ensure that better quality produce fetches a higher price. WARDA also provided technical assistance to FPOs, focusing on improving transparency by using digital weighing machines, sharing price information on a daily basis to curb market information asymmetry, and introducing cashless transactions. These market interventions resulted in 679 smallholder women farmers selling their potato harvest through a more transparent mechanism. 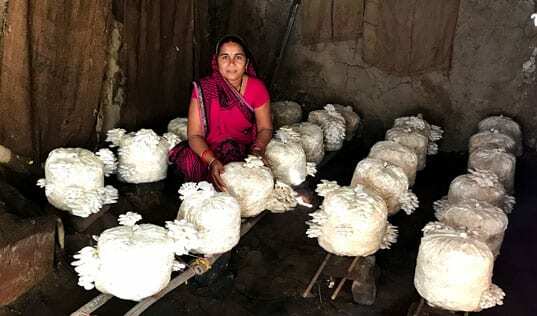 Renu Devi has emerged as a champion in the cause, playing an active role as a community mobilizer, supporting women smallholder farmers, and organizing trainings on sorting, grading, and weighing. She mobilized 62 farmers and helped facilitate the sale of nearly 13 metric tons of potatoes from her village. For Renu and the other women in her group, WARDA has ushered a welcome change in their livelihoods and their sense of agency. “My father didn’t think it was important to invest in my studies. We were raised to lead a life inside the four brick-walls of our house,” she says. Now her eyes gleam with pride and determination at the change she was instrumental in bringing to her community. “TechnoServe and JEEViKA together have given me a ray of hope. I wish to take part in more such activities in the future,” she says while cooking a curry for the evening meal with potatoes from her own patch of land.